I started this series – 100 Pages – for the books I can’t finish, but which I still think might have merit. Chef, shortlisted for the Commonwealth Writers’ Prize for Best Book, falls into that category. I received my copy through LibraryThing’s Early Reviewer program. So let’s rip off this band-aid quickly. Kirpal “Kip” Singh, the novel’s narrator, is dying of a brain tumor. Kip has been summoned back by his old commander, General Kumar, the Governor of Kashmir. The General has requested that Kip cook the wedding feast for his daughter’s marriage to a Pakistani Muslim. These two men have something in their past, something Kip is intent on resolving before he dies. On the rail journey to Kashmir, he remembers his apprenticeship under the General’s first chef decades before. He recalls the circumstances which he led him into the army. An innocent young man, most of Kip’s flashbacks revolve around his attempts to rid himself of his virginity. So, not surprisingly, from the book’s French flaps we learn that the rift between Kip and the General occurred because of a woman – a lovely Pakistani woman who washes up on the river bank and is accused of being a terrorist. But I never actually reached that point in the narrative. 100 pages, over a third of the way into the novel, Jaspreet Singh is still laying the foundation of his story. The pacing is incredibly slow; the writing is thick and torpid. The reader spends all his time trapped within Kip’s head and entangled in Kip’s memories. Which is probably the main reason why I was unable to lose myself in Chef. Kip by turns bothered and bored me. He sees every woman he meets as a possible sexual partner. His courting technique consists of approaching the current object of his affection (who, more often than not he is barely acquainted with) and staring at them creepily until they gently rebuff him. He get’s lots of sexual advice, along with culinary training, from the chef who he serves under – equally creepy. And while Singh may have felt this to be necessary in order to develop the story – it was more than I was interested in reading. Ultimately, despite the amount of time spent following Kip’s thoughts, he never became a fully developed protagonist for me. Every scene is rife with emotional undercurrents that I was unable to decipher. The prose felt too thick. Eventually, I just stopped caring. For me – finishing the first 100 pages of Chef was a struggle. But not everyone shares my opinion. KevinfromCanada felt differently. As did Page247. Their reviews are well written and worth reading. They also are, on the whole, positive. 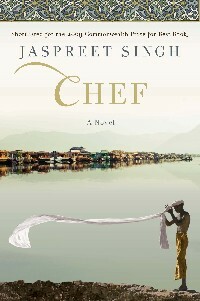 So if anyone is interested in a gently used copy of Chef by Jaspreet Singh – comment below and send me an email at BookSexyblog@gmail.com. OR, if you’ve read the novel and loved it – let me know why. Maybe I gave up too soon… maybe it just wasn’t my cup of tea. It is always a little difficult for me to put down a book I am not enjoying. I guess always feel a little bad for the author and the spent effort. I think I have learned how to do it here, you do a great job of explaining why you didn’t enjoy the novel and it was a rather helpful tip to me as a writer. Apologies for taking so long to respond, and thank you for the compliment! I started doing the “100 Pages” series just to deal with that kind of situation: the guilt that comes with putting down a book you aren’t enjoying. There are some authors who you realize have worked hard and spent a great deal of effort and time crafting a narrative. I thought a review (even an incomplete one )would be a good way to acknowledge that regardless of whether book, itself, is to my taste.